I was excited to start rowing Madeline , because Haley and I LOVED curling up and reading the entire A Madeline Treasury together! I wasn’t sure the boys would share our enthusiasm, but I was pleasantly surprised. They LOVED it too! We chose to memorize I Peter 3:10-12 since it focused on turning away from evil and doing good just like the girls in the story. I created a Bible verse pack to go along with this row. You can purchase the pack at our TPT store. We try to keep our printables VERY affordable and throw in a few FREEbies too! You can download the tracer FREEBIE here as our gift to you! Parker traced the worksheet while Jordan traced the lapbook insert. The boys worked on the Bible verse puzzle throughout this row. Madeline and the other girls lived in a house of order and we talked about the importance of routine. We also talked about how God is a God of order, not chaos. Earth Day fell on a Sunday this year, but we celebrated it the next day. We took this opportunity to read about creation and talk about the Lord being a God of order. I made “earth bagels” (toasted bagels with cream cheese swirled with green and blue cream cheese). The kids ate their breakfast while I read the The Story of Creation and some inserts from our Prayers for Children book. After breakfast, we went to the playroom and I read more about creation while the kids colored their creation bookmarks (The Crafty Classroom). We also read God the Creator Thought of It First! from our Happy Day Family Treasury. This was a great story about how certain technologies/inventions were inspired by God’s designs in creation. I set up a recycling activity that I found at the dollar store. The kids worked on this activity at different times. We played a few rounds of creation bingo (Christian Preschool Printables). The boys added some creation inserts into their lapbooks. They worked on ordering the days of creation on our white board too! The girls “smiled at the good” and “frowned at the bad”. We talked about turning away from evil and doing good, being kind, and showing empathy. We read Charlie’s “Be Kind” Day and talked about trying really hard to stop being grumpy and grouchy and instead make a real effort to be kind. We also read Suzy Swoof – A Story about Kindness from our Helpful Hal’s Treasury of Christian Virtues. Jordan LOVES these stories and so do I. It keeps his little heart full of “good things” that encourage him to “smile at the good” and “frown at the bad”! We read Little Helper, a darling story about a little girl who wanted to help God with big jobs, but she realized she could be helpful doing small jobs too. Then we read Handy-Dandy Helpful Hal which encouraged kids to help their parents by pitching in and helping out around the house. We tried to think about something we could do to show empathy. We decided to make cards for grandma since she was really sick and was missing her grandchildren. We read Paris on our Epic app. Jordan added the story disk to our world map. Then we read Richard Scarry’s Pierre, the Paris Policeman. The boys completed their Tour d’ France lapbook insert from Homeschool Share. 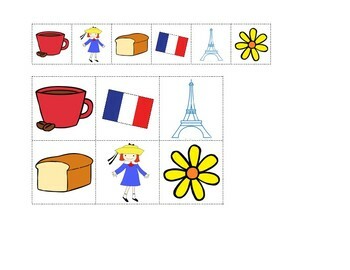 We read The Eiffel Tower and Building Stories on our Epic app. The kids drew the Eiffel Tower following an art tutorial (Art for Kids Hub) on our Madeline playlist. There are SO many great cookie structure pins on Pinterest. We bought out sugar wafer cookies and a tub of frosting and the cookie engineers we’re ready to build! The boys were a bit disappointed that their structures weren’t turning out as expected. Haley whipped out her cookie structure and it was solid (as a wafer cookie could be)! If at first you don’t succeed, give up? Never! The boys had to try a few different methods before they had a “somewhat” sturdy structure. We read Ratatouille during school and I made ratatouille that evening. Daddy and I were the only ones who REALLY liked it, but it’s always a good thing to expose the kids to new foods! After dinner we watched Pixar’s Ratatouille as a family movie night! The kids LOVED munching their madeleines! We read French Food by Sara Gilbert on our Epic app. We knew that Crepes were in our future, no matter what! He measured all the ingredients very accurately, adding fractions in his head when needed. I LOVE that he’s up for the challenge of recalculating the quantities “on demand”. It’s definitely a skill he will use his entire life! Jordan LOVES cracking the eggs….he has ever since he was a toddler. I’m glad we cooked then even though it was messy and crazy at times! SO worth it! Then added the remaining ingredients and whipped them to a smooth consistency. We set the batter aside to rest. Once our batter rested awhile, we heated our pan, brushed it with melted butter, and scooped our crepe batter into the pan rolling the batter around in a large thin pancake shape. Jordan and I made the crepes together, but he really enjoyed flipping them! We made a bunch and set them aside. During intermission, everyone chose their toppings and devoured them quickly! They were SUPER yummy! We read Is It Symmetrical? on our Epic app and I handed out our FIAR symmetry worksheet (FIAR Fold & Learn), and some colored paper shapes. I explained how to create a symmetrical design by adding the same shape on each side of our line of symmetry. Jordan worked on his art project right away since we had reviewed symmetry a few weeks earlier during one of his Horizon Math lessons. We opened our book to Miss Clavel’s house and noticed it was very symmetrical. I handed the boys another symmetry activity (education.com) and this time instructed them to draw Miss Clavel’s house. With his ruler in hand, Jordan started drawing Miss Clavel’s house. Parker and I worked on Miss Clavel’s house together. I helped draw the top and bottom line of the windows and Parker finished them. Next, we added the door and vines. They turned out great, but we set them aside for more fun (later in this post)! I brought out Richard Scarry’s Best Storybook Ever and we read through our Buildings page. Jordan placed a yellow button on all the symmetrical buildings on the page. He really understood this concept. Madeline and the girls stood in two straight lines. I made a “quickie” worksheet for Parker to use during this row. We colored it and he used it to skip count by TWOs. I realized I should have made it reusable, so I created another worksheet and taped the boxes on the right. We used this worksheet to practice skip counting by twos, threes, fours, and fives. We used our cubes as “girls” to give us another visual representation for skip counting. We brought out our yellow buttons to use as markers. First, Parker verbally skip counted by whatever number we worked on (two, three, four, five, etc. ), placing a button for each number. Afterward, he wrote the numbers in the squares. We reused this worksheet MANY times during this row. 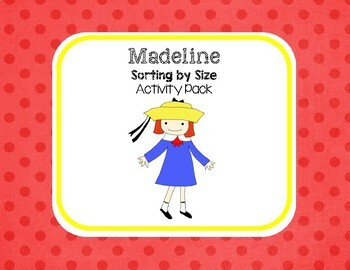 Later on I created a Madeline Skip Counting by TWOs pack to use with Parkie. Parker used the skip counting mat to count by THREEs. Next, he used the mat to skip count by FOURs. I’m slowly introducing the concept that skip counting leads to multiplication. I used the Daisy Picking worksheet to write multiplication equations and he cut and pasted the answers. I made a flower factors worksheet for Jordan to work on his division skills. I handed him our cup of yellow buttons. We counted out twelve and he worked on grouping them to figure out all the factors of twelve. We continued to work on factors of twenty-four, thirty-six, and forty-eight. “They left the house at half past nine…”. We really worked on our quarters of time (i.e. o’clock, half-past, quarter after, and quarter till). I brought out our Telling Time Clock (The Crazy Schoolteacher) I made a few years ago with Jordan. Using our yellow buttons, I asked Parker to mark the quarters on the clock. Then we used the opportunity to skip count by FIVEs while placing the yellow buttons on the numbers around the clock. We brought out our Helpful Hal’s Treasury of Christian Virtues and read Suzy Swoof A Story About Kindness. The last page was a verse about the fruits of the spirit, so I felt inspired to do a fruity math lesson on size. We did a few rounds of ordering various fruits by size (largest to smallest and smallest to largest). The boys worked well on each of these. Next, I grabbed several fruits and asked the boys to order them by size. We took the smallest fruit in the previous group and put it with fruit that was “smaller” and “smallest”. We realized that terms like “smallest” is relative to what you’re comparing it with. 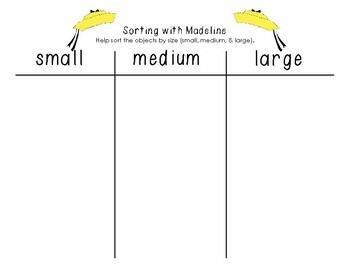 I created this FREEbie Madeline Sorting by Size math pack after our “fruity” math lesson. You can grab your copy here at our TPT Store. It just so happened Haley was learning about germs in her Sonlight Core E science lessons, so we were having all sorts of germy experiments around the house! I set out the ingredients to make the base for her petri dishes. We put a pot of boiling water on the stove and she stirred in her ingredients. While her experiment brew was simmering, she marked her petri dishes “washed” and “unwashed”. She poured the liquid in each petri dish and we immediately covered them (so not to expose them to further contamination in the air). She washed her hand and placed her “clean finger” in the “washed” petri dish, placed the cover on, and taped it shut. Next, I instructed her to touch the “unwashed” petri dish once she used the bathroom BEFORE washing her hands (So gross right? It’s a GREAT visual aid for kids learning how important it is to WASH AFTER USING THE RESTROOM!!!). We set the petri dishes aside and waited a couple of weeks…..now the BIG and UGLY reveal. (BTW – the globules on the top were part of the fats in the brew, so look for flecks of hair or white growth). There were some little flecks of white moldy spots which is also a lesson on making sure we wash our hands properly. We started our germ lesson by reading Germs Are Not For Sharing. Next, we traced our hands on a sheet of white construction paper and painted them with glitter glue. Before wrapping up our craft, we smeared some of the glitter glue on our hands and made sure it was sticking to our skin. We examined our hands and talked about how the glitter represented germs that stick to our hands. First, we tried rinsing our hands with just water. We examined our hands and found they were still glittering with germs! Next, we used soap and washed our hands while singing a wash your hands song (to the tune of “Row Row Row Your Boat”). We examined our hands and found that “most” hands were free of glittery germs while other hands needed a second washing. This was a fabulous illustration for kids to “see” the importance of thoroughly washing their hands. We set aside our glitter hands to dry. The kids colored a really cute germies worksheet (crystalandcomp.com) to add to our germie hand craft. I helped cut them out and they glued them to their colored construction paper. We set them aside to dry. I cut out their glitter hands, germies, foam letters, and various sized string. The kids glued their hands to construction paper and stuck the foam letters to spell “germs”. Then they added “are not for sharing” to the bottom of the page. They taped their dangling germies to the back of the paper. Have you ever used the five second rule? You may want to consider abandoning the five-second rule BEFORE you put anything in your mouth that once fell on the floor. We checked on our bread a few weeks later, but nothing grew. We read Happy Healthy Monsters Grover’s Guide to Good Eating to start our lesson on healthy eating. First, we dumped out our play food and sorted by food group (protein, dairy, grains, vegetables, fruits, and treat foods/fats). While we sorted we talked about how some items aren’t as healthy as others (e.g. grilled chicken vs. hamburgers). The boys made meals and we talked about what food groups were included on their plates or which food groups were missing. Let me just say….I’ve wanted to do this activity since I first saw it online. I took most of my inspiration from Look What Erin Made. Before starting this activity, I precut our paper bags to ensure they would have head and arm holes. Jordan and I painted our paper towel rolls light pink and set them aside to dry. Jordan worked independently on this activity (with a few tips from me). He taped the body parts (Confessions of a Homeschooler) to his paper bag. Parker and I used our Usborne Children’s Encyclopedia (Sonlight Core A) as reference while putting our bodies together. After glueing on our body parts, we attached our anatomy labels underneath. They boys tried them on and they were looking great, but we needed to add a few finishing details the following week. We added our esophagus’ and a “working stomach” (a ziplock bag taped to the bottom of the tube. We “swallowed” some candy (foam conversation hearts dropped into the tube) and they landed in our “stomachs” (ziplock bags)….that was AWESOME! The boys kept doing this over and over again. Last, we added “working lungs” (ziplock bags and straws taped to the top) so the boys could “pump air” into their lungs (via the straws). This was ALSO a big hit! They kept “eating” and “breathing” and even made a video for one of their buddies! This was SUPER fun and I’m SO glad we took the time to complete it! Remember the “Miss Clavel’s House” symmetry drawings the boys worked on earlier in our row? Well, we brought them back for a fun seed sprouting activity! We started this activity by reading The Sunflower Parable and the kids selected their seeds and we soaked them in water overnight. Haley wasn’t with the boys when they drew Miss Clavel’s house, but she quickly caught up. The kids dumped out their seeds and water on the plain paper towel and folded them in half. They taped Miss Clavel’s house to the front of their ziplock bag and partially closed the seal. Then they added a “Grow in God” flower (Mrs. Jones’ Creation Station) to the front. The kids taped them to the window where we left them for a couple of weeks. A few weeks later, the kids brought out their sprout houses and transplanted their seedlings in the garden. We made sure to leave pellets around our baby sunflowers to keep those hungry slugs and snails at bay! The kids were SUPER excited to start planting again. I hope their sunflowers grow big and tall, just like in the book! While reading Curious George Discovers Germs, we saw a recipe for Chicken Noodle Soup at the end of the book. Jordan REALLY wanted to make it. I prepped the vegetables the night before, so it would be easier for Jordan to make it at the end of our school day. We sautéed our vegetable base which included carrots, celery, and onions. It smelled delicious! The book suggested adding tomatoes, spinach, along with the chicken and noodles. I added white kidney beans, garlic, spinach, and tomatoes too! It was SUPER yummy! I saw a cute pin for making Madeline’s hat with Nilla wafers. I decided to try this on top of our zucchini brownies. They were pretty cute and the kids LOVED them! Haley insisted we have a tea party at the end of our Madeline row and I thought that would be a GREAT way to finish this row! As it turns out, our last day fell on May 4th (May the 4th be with you) which is pretty HUGE in our home. So our really Fancy Nancy style tea party ideas went into the trash compactor and we partied like the Padawan learners we truly were! We started our day with a Star Wars Breakfast including Blue Bantha curds (cottage cheese tinted blue), Sarlac fruit (inspired by the pit that gobbled Boba Fett), and BB-8 cakes (pancakes decorated like the little round droid EVERYONE loves)! Later that afternoon, I prepared various Star Wars themed cookies, fruits, and veggies for the kids to enjoy. Some were pretty obvious and others were more like those “nailed it” pins you see that make you LOL! This wasn’t French or remotely connected toMadeline, but EVERYONE enjoyed this fun and festive way to end this row!